Reference: D. Tarkhnishvili & R. Gokhelashvili, 1999. The Amphibians of the Caucasus. Pensoft, Sofia. 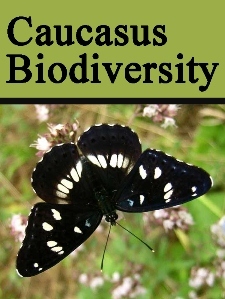 Relic species, endemic of SW Caucasus. Subspecies M. c. janashvilii (Tartarashvili & Bakradze, 1989) at Mt. Mtirala near Batumi and probably along the Black Sea coast. Comosed of two evolutionary species, M. sp. 1 in the basin of Mtkvari (Kura) river and M. sp. 2 in the basin of Black Sea, non-recognisable morphologically (Tarkhnishvili et al., 2000). 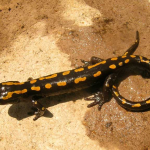 Closest relative: golden-striped salamander (Chioglossa lusitanica) from the NW Iberian peninsula. Separation from the sister taxon ca. 15 MY (Veith et al., 1997). Palaeonthological species M. cf. caucasica, Polish Carpathians, lower Pliocene (Sanchiz & Mlinarsky, 1978). 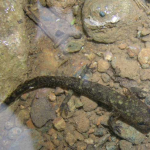 Stream-dwelling salamander of midde size, with a thin elongated body. Strictly nocturnal. Female deposits 10-25 relatively large eggs in hidden places in water or outside water in humid areas. Larval development lasts one to three years. Conservation Status (International): IUCN status (international) VU, B2ab(ii,iii) ver 3.1. Definition (Area of occupancy estimated to be less than 2000 km2, and the area of occupancy is severely fragmented and continuing decline inferred for the area of occupancy and extent or area or quality of habitats). Relict narrow-ranged species. Economic importance (national): Currently absent. Potentially interesting as an attraction of herp-tourists and scientists. Is it not a flagship species important from the point of view of local population. Who conducts currently field research of this species in Georgia: Ilia State University, Institute of Ecology, Institute of Zoology. contact – David Tarkhnishvili. Ongoing projects: Currently, no ongoing projects. Monitoring of representative set of selected known populations would include seven field-days for two trained students per year. 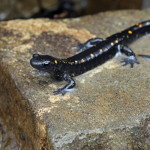 Why to monitor: Rare endemic salamander important for conservation. Good indicator of quality of mountain brook ecosystem. However, it is not considered as a species important for conservation by local population. Economically unimportant. Preliminary suggestion: Insert existent data (Range model, known locations) in a general easily accessible database for protected species of Georgia. 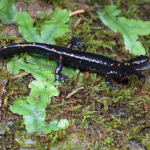 Organise biannual monitorig of presence-absence salamanders at ten locations evenly distributed throughout Georgian range. Requires ca. 7 field days every two years for an expert and a student to conduct. რელიქტური სახეობა, დასავლეთ მცირე კავკასიონის ენდემი. ქვესახეობა M. c. janashvilii (Tartarashvili & Bakradze, 1989) აღწერილია მტირალას მთიდან. შესდგება ორი ევოლუციური სახეობისაგან, M. sp. 1 მდინარე მტკვრის აუზიდან და M. sp. 2 შავი ზღვის აუზიდან; მორფოლოგიურად ისინი ვერ გაირჩევიან (Tarkhnishvili et al., 2000). უახლოესი ნათესავი: ოქროსზოლიანი სალამანდრა (Chioglossa lusitanica) ჩრდილოეთ ესპანეთიდან და პორტუგალიიდან. ეს ორი ტაქსონი ერთმანეთს გამოეყო დაახლ. 15 მილიონი წლის წინათ (Veith et al., 1997). პალეონტოლოგიური სახეობა, M. cf. caucasica, ნაპოვნია პოლონეთის კარპატების ქვედა პლიოცენში (Sanchiz & Mlinarsky, 1978). საშუალო ზომის სალამანდრაა, მოგრძო, ვიწრო სხეულით და ძალზე გრძელი კუდით. ბინადრობს წყაროებთან და ნაკადულებთან. ღამის ცხოველია. მდედრი ამაგრებს 10-20 ღია ფერის კვერცხს დიამეტრით 5 მმ-მდე თითო წყლის ზედაპირთან ან წყალთან, მალულ ტენიან ადგილებში. ლარვები 3 წლამდე წყალში ცხოვრობენ. კონსერვაციული სტატუსი (საერთაშორისო): IUCN სტატუსიVU, B2ab(ii,iii) ver 3.1. განმარტება (შეფასებული გავრცელების არე 20,000 კმ2- ზე ნაკლებია და დაკავებული ფართი ფრაგმენტირებულია და დაკავებული ფართი მცირედება და ეცემა ჰაბიტატების ხარისხი). რელიქტური მცირე არეალის მქონე სახეობაა. ეკონომიკური მნიშვნელობა (ეროვნული): ამჯამად არ არსებობს. პოტენციალურად საინტერესო სახეობაა ბუნების მოყვარულ ტურისტებისთვის და მეცნიერებისთვის. კონტაქტი/ მიმდინარე პროექტები: ილიას სახელმწიფო უნივერსიტეტი, ეკოლოგიის ინსტიტუტი, ზოოლოგიის ინსტიტუტი. საკონტაქტო პირი - დავით თარხნიშვილი. ამჯამად არ იკვლევა. შესაძლებელია რჩეული ჰაბიტატების მონიტორინგი (10 ლოკალიტეტამდე) ორ წელიწადში ერთხელ. რელევანტური ინფორმაცია: არეალის ზომა: Tarkhnishvili et al. (2008) მოდელი აჩვენებსდაახლ 1,000 km2 გავრცელების არეს და 1,782 km2 პოტენციურად სასარგებლო ფართობს აღმოსავლურ ევოლუციურ ხაზისათვის. დეტალური საკონსერვაციო მოქმედების გეგმა (Tarkhnishvili & Kaya, 2009) მისაწვდომია მისამართზე http://assets.panda.org/downloads/cepf_caucasus_web_1.pdf. რატომაა საჭირო მონიტორინგი: იშვიათი ენდემური ცხოველია. მთის წყაროების მდგომარეობის კარგი ინდიკატორი. რეკომენდაცია: არსებული ინფორმაცია ჰაბიტატების შესახებ შეტანილ იქნას მისაწვდომ მონაცემთა ბაზაში, გაკეთდეს 10 ჰაბიტატის მონიტორინგი ორ წელიწადში ერთხელ. მონიტორინგს ადვილად განახორციელებს ორი დატრენინგებული სტუდენტი 7 დღის განმავლობაში. Distribution: Western foothills of Trialeti range, Meskheti range, Shavsheti range, east Karadenis mountains, from Nedzvi-Bakuriani to Giresun-Gumushane. West Lesser Caucasus. Franzen, M. 1999. 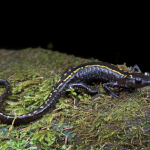 Mertensiella caucasica (WAGA, 1876) - Kaukasus-Salamander. Handbuch der Reptilien und Amphibien Europas. Band 4/1. Schwanzlurche (Urodela). Grossenbacher, K.G. and Thiesmeier, B.,editor. 1:329-366. Aula Verlag. Wiesbaden. Klewen, R., 1988. Die Landsalamander Europas. I. Die Gattungen Salamandra und Mertensiella. Die Neue Brehm-Bucherei, A.Ziemsen Verlag, Wittenberg Lutherstadt. 184p. Tarkhnishvili, D.N. and Gokhelashvili, R.K. 1999. The amphibians of the Caucasus. Advances in Amphibian Research in the Former Soviet Union. 4:1-229. Atatur, M.K. and Budak, A.,1982. The present status of Mertensiella caucasica (Waga, 1876)(Urodela: Salamandridae) in North-Eastern Anatolia. -Amphibia-Reptilia, 1982(4): 295-301. Cyren, O.,1911. 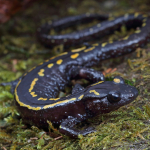 Beitrage zur Kenntnis des Kaukasischen Feuersalamanders, Salamandra caucasica (Waga), seiner Lebensweise und Fortpflanzung. -Berichte der Senck. Natur.Ges. in Frankfurt a/M, 42: 175-189. Ekvtimishvili, Z.S.,1944b. 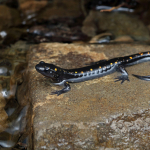 On the biology of Caucasian salamander (Mertensiella caucasica Waga). -Tbilisi, Publ.Inst. of Zoology Georgian Acad.Sci. : (Georgian). Ekvtimishvili, Z.S.,1948b. Feeding of Caucasian salamander (Mertensiella caucasica Waga). -Proc.Inst.Zool.of Georgian Acad.Sci. 8: 239-245(Georgian). Franzen, M.,1985. Mertensiella caucasica (Waga,1876) (Caudata:Salamandridae) im Meershohe. -Salamandra, 21(1): 98-99. Freytag, G.E.,1954. Der Kaukasus-Salamander, ein Seltener Terrarienpflegling. -Aquar.Terrar.Jb.Jena: 115-119. Knoblauch, A.,1905. Der Kaukasische Feuersalamander, Salamandra caucasica (Waga). -Berichte der Senckenbergischen Naturforschended Gessellschaft in Frankfurt a/M, 36: 89-110. Korolyov, A.V.,1986. Some data on the larvae of Mertensiella caucasica. -In: Z.Rocek (Ed. ), Studies in Herpetology: 281-283. Kuzmin, S.L.,1992. 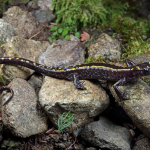 Feeding ecology of the Caucasian Salamander (Mertensiella caucasica), with comments on life history. -Asiatic herpetological Research, 4: 123-131. 14. Mertens, R.,1942. Der Kaukasus-Salamander und Sein Gefangenleben. -Bl.Terrar. k. 53: 9-16. Mertens, R.,1968. Bemerkungen zur "Normalentwicklung" des Kaukasus-Salamanders. -Salamandra, 4: 44-45. Obst, F.J. and Rotter,J.,1962. Notizen zu Mertensiella caucasica (Waga,1876). Aquarien und Terrarien Zeitschrift 15(2): 50-52; (3): 84-86. Schultschik, G.,1994a. Zur Fortpflanzungbiologie von Mertensiella caucasica (Waga,1876)(Urodela: Salamandridae).- Abh. Ber. Naturk., Magdeburg 17: 163-175. Schultschik, G.,1994b. Mertensiella caucasica: Haltung, Nachzucht und Freilandbeobachtungen. -Salamandra, 30(3): 1-14. Tarkhnishvili, D. N., 1994a. 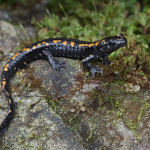 Interdependences between populational, developmental and morphological features of the Caucasian salamander Mertensiella caucasica. - Mertensiella (Bonn), 4: 315-325. Tarkhnishvili, D. N. and Gokhelashvili, R. K., 1994. Preliminary data of the age structure of a Mertensiella caucasicapopulation. - Mertensiella (Bonn), 4: 327-334. Tarkhnishvili, D.N. and Serbinova, I.A.,1993. 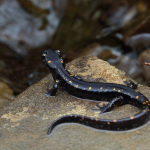 The ecology of the Caucasian salamander (Mertensiella caucasica Waga) in a local population. -Asiatic Herpetological research, 5:147-165. Tarkhnishvili, D. N. and Serbinova, I. A., 1997. Normal development of the Caucasian salamander (Mertensiella caucasica). -Advances in Amphibian Research in the Former Soviet Union, 2: 13-30. Tarkhnishvili, D. N. and Serbinova, I. A., 1998. Giant larvae of the Caucasian salamander (Mertensiella caucasica). -Ibid, 3: (in press). Tarkhnishvili, D.N., Thorpe, R.S. & Arntzen, J.W. (2000).Pre-Pleistocene refugia and differentiation betweenpopulations of the Caucasian salamander (Mertensiellacaucasica). Molecular Phylogenetics and Evolution 14,414–422. Sayim, F., Başkale, E., Tarkhnishvili, D. & Kaya, U. (2009): Some water chemistry parameters of breeding habitats of Caucasian salamander, Mertensiella caucasica in the Western Lesser Caucasus. Comptes Rendus Biologies 332: 464-469. Waga, 1876. Nouvelle espece de salamandride. -Rev.Mag.Zool. (3): 326-328. Wolterstorff, W., Lantz, L.A. and Herre, W.,1936. Ein Import des Kaukasischen Salamanders (Mertensiella caucasica). -Zool. Anzeiger, 116(1/2): 1-13.